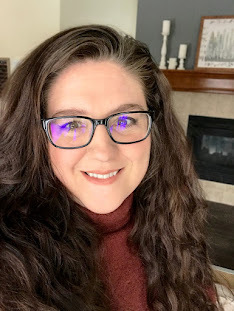 I've been wrapped up in some serious quilting deadlines of late but I wanted to wish everyone a Happy Thanksgiving and share some exciting news! Both Trellis and Fringe Area are available in four different colorways and all Honest Fabric designs are available in three sizes. Karlee's is offering 10% off your order at Honest Fabric with code 10HQF18. I've ordered my Trellis design in the orange colorway (50" x 60") and can't wait to get quilting. I'm especially looking forward to quilting with no bulky seams to worry about. While at QuiltCon this year I met with Quiltmania's Director of Publication, Carol, and we discussed having a quilt or two published in Simply Moderne quilt magazine. I was overjoyed to have this opportunity to have my Mountain Scene quilt published in the Winter issue and earlier this week I found out Mountain Scene is also on the cover!! 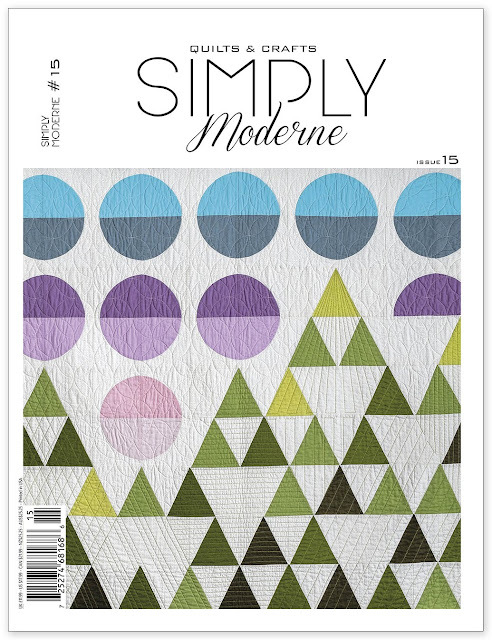 The Winter issue of Simply Moderne will first be available at Houston Quilt Festival and later on the Quiltmania website. If you are going to be attending Quilt Market and the Show please stop by the Quiltmania booth and pick up the Winter issue and maybe get a look at my quilt! Mountain Scene is a great geometric design and very versatile. 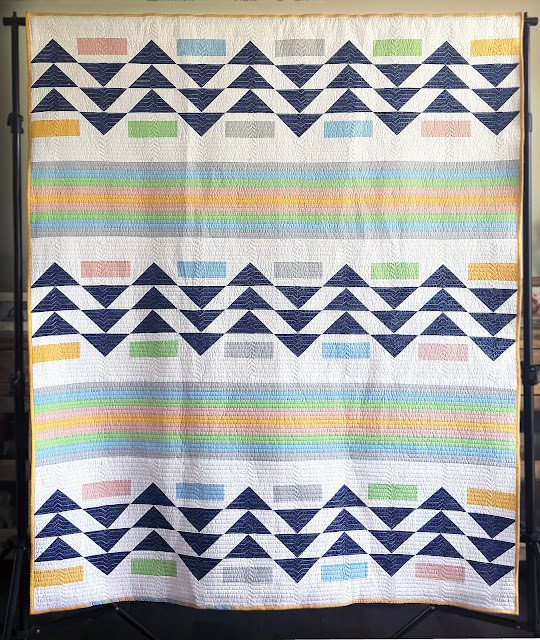 Heather Givens has a quilt kit available in her shop, Crimson Tate, featuring her own Night Hike fabric collection. I'll start with the good news. Out this month is my Dockside quilt pattern in the Nov/Dec issue of Modern Patchwork, available for purchase here. I designed this quilt in the summer when a quick trip to Sullivan Lake sounded so nice. I used flying geese facing different directions to create motion and that outdoor-Pacific Northwest-camping feel. For this quilt I used Hoffman Fabrics Me and You Indah Solids. I love the hand dyed feel of these solids. They come in a variety of beautiful colors and are so easy to work with. 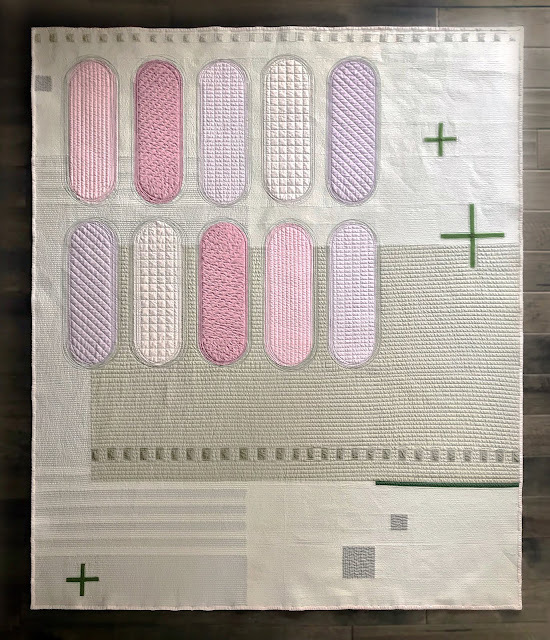 When I quilted this I wanted to keep it simple so I chose horizontal straight lines, of course, but added a little "v" corresponding to the direction the column of flying geese were pointing. I love the subtle movement in the quilting. 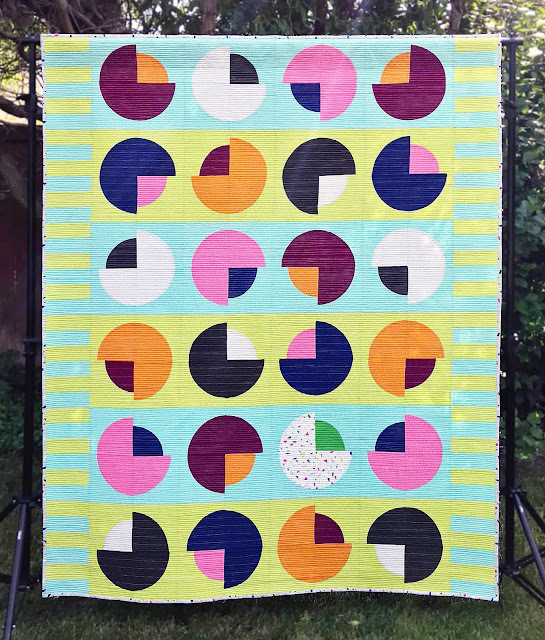 September's Modern Quilt Guild's Quilt of the Month is my Jawbreakers quilt! 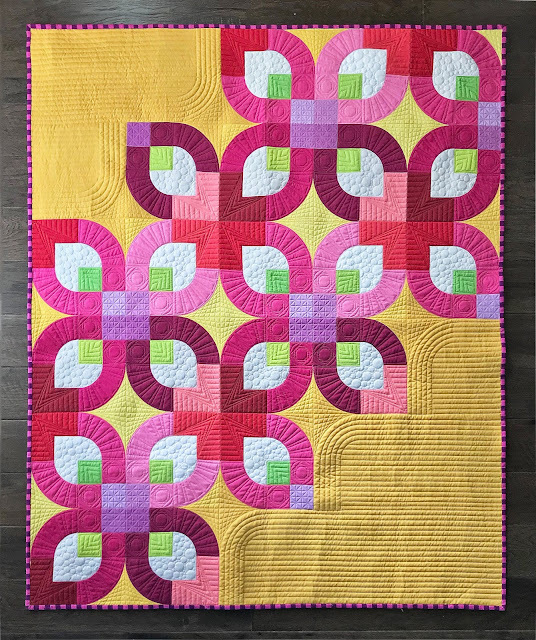 The inspiration for this quilt comes from all the 10 cent drug store candies that I scrimped and saved for when I was a little girl. Even the "piano key" details on the sides are directly inspired by candy packaging. I've also decided to retire my Quarter Hours quilt and replace it with Jawbreakers for my Modern Drunkard's Path workshop. 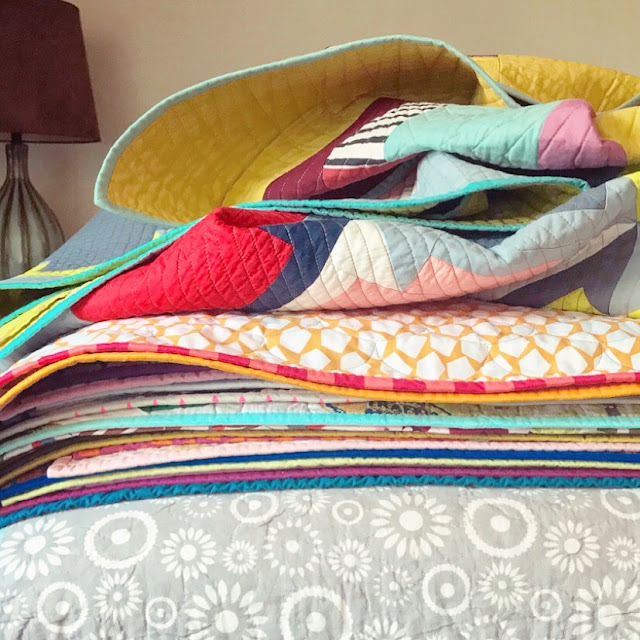 Both quilts are the same size and use the same template but Jawbreakers is more versatile and I can teach a second method for cutting curves. This quilt is a free download for all Modern Quilt Guild members. 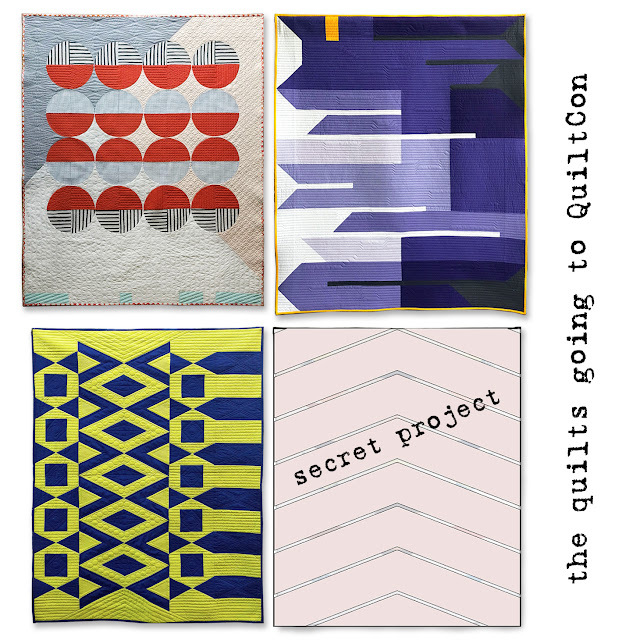 Each month they release a pattern designed by a fellow member along with a quilt block as part of their Block Study. 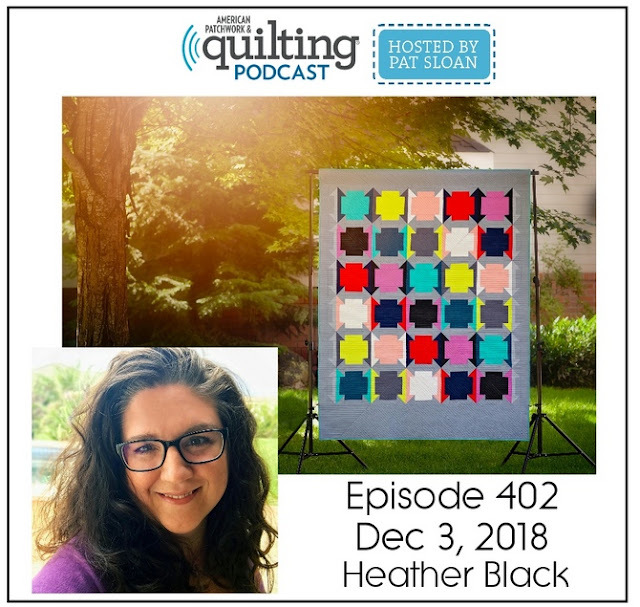 There are some really amazing patterns and blocks available to members and I'm so honored to have two quilts selected as a Quilt of the Month this year.